Mundial Scissors and Shears...On Sale! Mundial Scissors - Excellence in Design & Performance - On Sale Now! We guarantee the best quality on every item we sell! Our new 4 1/4 in. Cushion Soft Embroidery cushion soft scissors are perfect for sewing! They are comfortable, precise and easy to use. These scissors are ambidextrous and a great choice for sewing, quilting, needlepoint and applique work. The master quilters in our Quilt Guild love them. 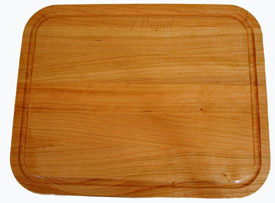 This reversible Cherry Hardwood cutting board is ideal for prep work, carving and presentation. Use the smooth side for chopping, slicing, dicing & mincing. The reverse side for carving meats, it features a grooved perimeter that collects the juices from poultry and meats. Take this board from the grill to the table. The board is hand made of cherry wood, which will darken over time. Hand washing and a few drops of mineral oil from time to time will keep it in top condition. 14 x 11 x 3/4 inch. Made in the USA. Click here for Extra Thick Maple Cutting Boards! This is a two piece gift set of Mundial cushion soft scissors! They are quite comfortable to use. One pair of 8 1/2 in. Dressmaker Shears and one pair of 5 1/2 in. Hobby scissors. These scissors are both ambidextrous. Made to last for years of daily use! They come with a Lifetime Warranty! Click This Button to Send Us your Check! We give you a free Lifetime warranty with every pair of scissors! This is the mundial "Seamstress Duo" gift set. They are lightweight and comfortable. The set contains one pair of 8 1/2 in. Lightweight Dressmaker Shears and one pair of 8 1/2 in. Pinking Shears. This two piece gift set of Mundial "Sewing Class" scissors is what more quilter prefer to use! The set contains a 8 in. pair of Dressmaking Shears and a 4 in. pair of Embroidery scissors. Click Here for Scissor Storage Solutions! 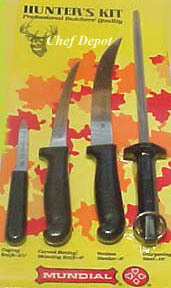 This is a set of 6 Serrated Steak Knives. Mundial Traditional knives are made of the finest German steel! 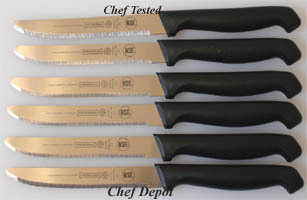 This set of 6 steak knives features comfortable poly handles for a traditional look and feel. These steak knives have wavy serrated edges - made from high carbon chrome moly all cutlery steel which holds a sharp cutting edge longer than the competition. These steak knives come with a Lifetime Warranty! Our reversible Au Jus Solid Maple Cutting Board! John Boos custom makes these cutting boards for us from first quality Solid Rock Maple, 24 inches by 18 inches and over 1 1/2 inches thick. This reversible board is NSF certified and will not dull your knife! With proper care, this Maple board will last for life! Oiling it with mystery oil, will keep it looking new. 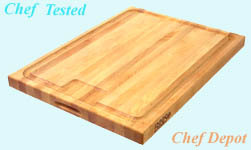 This board is the ideal size for most counter tops (it will not slide while cutting). This cuttting board can not be shipped outside the USA. Our Butcher Blocks are the best! Made in USA! Chef's Choice Diamond Scissor Hone For super sharp scissors all the time! The Scissor Pro electric scissors sharpener uses 100% diamond abrasives and built-in precision angle guides for professional quality edges quickly and easily. Sharpens a wide variety of household scissors from delicate embroidery scissors to knife-edge shears, even poultry shears! Safe for quality scissors. No dis assembly of scissors required. Can be used for left-handed or right-handed scissors. You'll never again have to waste valuable time and money sending scissors out for sharpening! Two self angled guides allow you to sharpen Coarse or Fine. Coarse is used to recondition damaged and very dull scissors, Fine is for finishing and honing to an incredible sharpness. One-year limited warranty. Made in the USA, 120 volts. Chef Notes: Perfect for all household, fabric and kitchen scissors. This sharpener is easy to use and you do not have to disassemble scissors. We sharpened 6 pairs of dull scissors in 3 minutes to a very sharp cutting edge. Our first test proves this machine works great & it's simple to use. Click Here for High Quality German Cutlery! Our new scissor sharpener is sweet. Ideal for quick sharpening of steel scissors, food processor blades, chip carving tools, fishing hooks, pruning shears,, hair shears. Advanced ceramic sharpening wheel for a superior sharp edge. Ergo design has comfort, control, stability and safety too. Chef Notes: Dig it. Works Great! This is not only for stainless steel scissors, it quickly sharpeners steel knives! A Chef reviews the new black blade Kyocera Ceramic Chef Knife. Notice, the knife is very sharp and cuts very easily. A sharp knife is required by every Chef and Gourmet cook. These cuts will take you practice to master. And black blade Kyocera Ceramic Chef Knives with riveted handles are here. Chef is using one of his NSF Maple Cutting Boards! This is the Mundial Quilters Duo pack, it contains a pair of 8 1/2 in. Pro Quilters Shears and a pair of 5 1/2 in. Fine Quilters scissors. Click Here for more Mundial Scissors.